It's easy to see why some games make it from concept to market. No-one at EA was going to turn down DICE when they decided the next game in the Battlefield series would have a modern warfare setting. CliffyB and co weren't exactly going out on a limb when they decided to set Gears of War in a future that was grim and brown and while Dirt 2 might retain Colin McRae's name its fusion of experience points, energy drinks and Xtreme stylings might well have come from some kind of MTV concept-o-matic machine. Then there are some games that are the complete opposite; those with surprising concepts and original ideas. While many of these – Katamari Damacy, Ico and Brutal Legend to name a few – are the product of fevered, obsessive, visionary geniuses, some left-field games strike you as being more the product of a lot of banned substances. Snoopy Flying Ace is one such game. 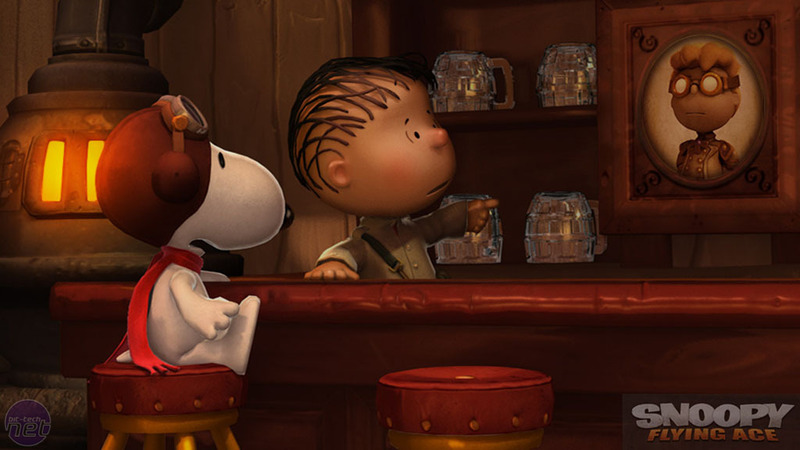 It features the cast of Peanuts – Snoopy, Woodstock, Linus, Lucy and of course, Charlie Brown – flying wooden World War One bi- and tri-planes armed to the teeth (Muzzle? Whiskers?) with weapons including homing missiles, sniper rifles and shotguns. 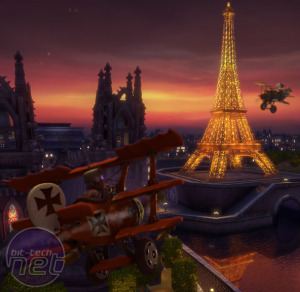 Despite its cartoon characters, the proceedings are surprisingly violent, packing in high-paced arcade aerial combat complete with stunt rolls as evasive manoeuvres. The Red Baron makes an appearance. So does Woodstock. Admit it. You think this sounds like complete tripe. A dog’s dinner, as it were. Surprisingly not: Snoopy Flying Ace is an entertaining and fast paced arcade game with a tough singleplayer campaign and comprehensive multiplayer options. As a downloadable title, retailing for 800 Microsoft points, it’s a bit of a bargain too. The signs are good the moment you’re introduced to the controls. They manage what all good arcade inputs should: they’re fast, responsive, and strike a good balance between simple (for accessibility) and complexity (so there’s actually enough to do). 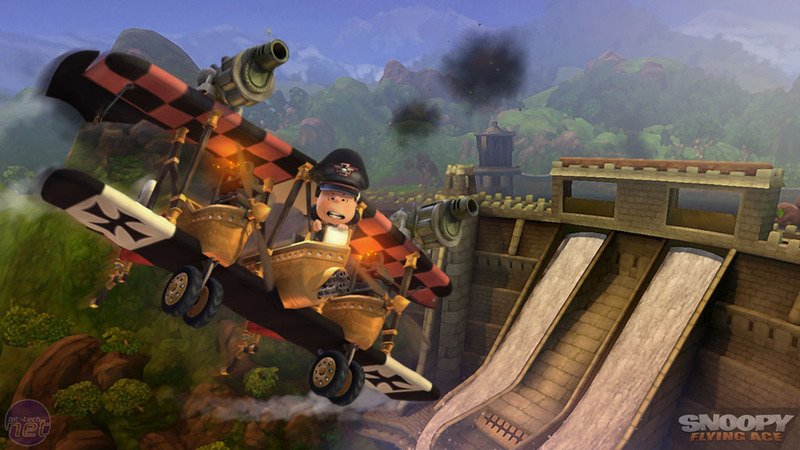 You fly as Snoopy, the game opting for a third-dog point of view; the left joytstick controls the plane, while the right essentially gives you four special moves for avoiding incoming fire – two loop-the-loops and two barrel rolls. There’s also a speed boost and an air-brake, which are both critical in dogfights. I'll tell you what's the matter Charlie Brown, it's them dem Jerries. There’s a brief tutorial and then in singleplayer, you’re presented with a map of Europe, with various missions dotted around it. Completing them unlocks new planes and different weapons. 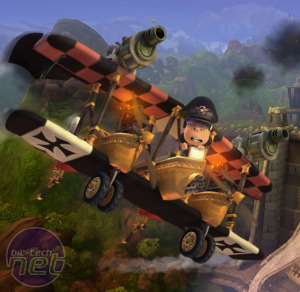 The planes have different speed, armour and manoeuvrability, while the weapons vary from brutal shotguns to homing missiles. There’s a genuine sense of diversity to the kit on offer, making the unlocks feel a good reward – and of course, they’re also necessary to get before you play multiplayer. The planes and weapons look excellent too, grounded in real life designs but not afraid to push into Stop the Pigeon territory with exaggerated, oversize features. It feels as if the developers have gone the extra mile, bringing gaming elements with real heft and depth to a game which could easily have been over-simplified. 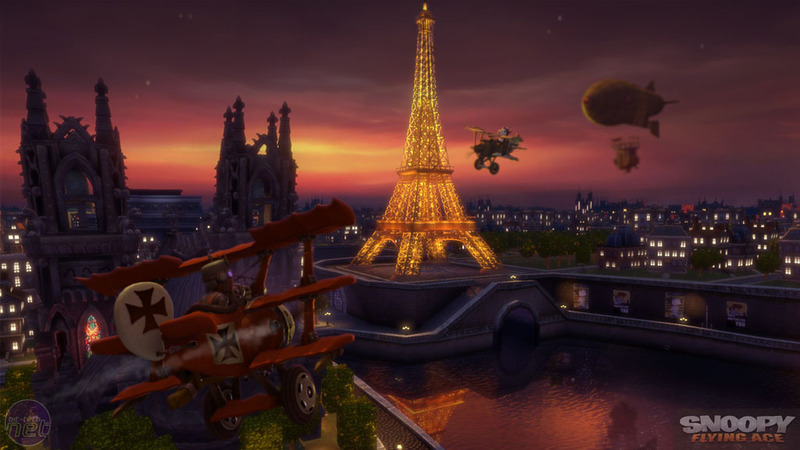 A bunch of developers from Microsoft's abandoned flight sim team has now formed a new studio.